Sat. Oct. 27th at 8:30, music at 9:00 pm sharp! The dark is coming. There's a chill in the air and a soft whisper tells you to look over your shoulder behind you. That's when you know it's time for the 17th Annual Murder Ballad Bash filled with songs of murder, misery, death, and despair. 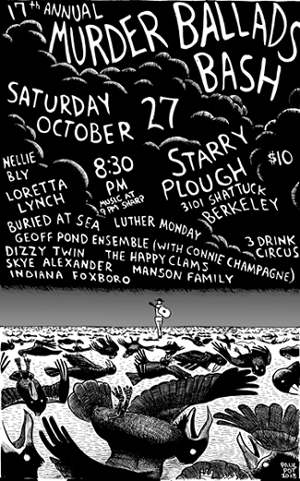 Featuring (not necessarily in order of appearance) Loretta Lynch, the Happy Clams, Nellie Bly, Dizzy Twin, Geoff Pond Ensemble (with Connie Champagne), Buried at Sea, Skye Alexander, Luther Monday, Three Drink Circus, Manson Family, and Indiana Foxboro. Costume contest. A Halloween tradition. NELLIE BLY: Detroit native Missy Gibson (vocals), along with Mike Flanagan (guitar, vocals, loops), had fronted L.A.-based indie-rock band BREECH for many years and now perform as Nellie Bly whose music is challenging, yet highly listenable, Their songs bulge with a kind of unvarnished brilliance that in the past has garnered rave reviews like, “… avenging-angel music for the jilted lover or the wronged artiste. . . it's snappy songwriting craft doused with a Tom Waits weirdness." They’ve been called creepy and elegant. Perfect, I’d say. LORETTA LYNCH: Let this city quintet with the country heart break yours into tiny jagged pieces and lift it up again with the ease of a shot glass. It’s a little bit front stoop, a little bit backwoods, it’s the art motel on a long stretch of highway…it’s Loretta Lynch! GEOFF POND ENSEMBLE: Formed for this years show. Some of the members have played together and separately at past Murder Ballad Blasts. Geoff has performed in three past MMB. As lead vocalist he will be bringing back two songs he has done before in new arrangements and instrumentation. Plus a new long form ballad or mini opera based on the murderous life of arguably America's first famous serial killer Dr. H.H Holmes of 1890's Chicago and his infamous murder castle. We are very thrilled to have San Francisco's chanteuse and Mutants vocalist Connie Champagne as a part of the band this year. We look forward joining in the fun creeping everyone out with our three songs! The band features Lori Higa - Bass, Lauren Hotchkiss - Keyboard, Mike McKevitt - Guitar, Geoff Pond - Vocals, composer, Cindy Webster - Accordion, Musical Saw, Vocals, special guest vocalist Connie Champagne. DIZZY TWIN is the musical equivalent of watching a carousel through a kaleidoscope. Loss and laudanum, circus tragedy, abduction and a child’s ghostly wrath, sweet pre-meditated revenge....these are the themes of the evening. Dizzy Twin is brought to you by Mia d’Bruzzi on vocals (Frightwig, Mudwimin, Gone to Ground), Paul Simmans on piano (Gone to Ground), Tim Purdue on bass (Velvetta, The Whoa Nellies, Enrique), and Michael Tornatore on drums (Watersaw, The Bikini Complex). Mike McKevitt on guitar will provide the coup de gras on what promises to be a very distressing 15 minutes. BURIED AT SEA: Drown your sorrows with the dark sounds of The Buried at Sea, an East Bay quintet fronted by the Psychotic Berry Brothers, Dave C. and John C., who have been performing and fighting their whole lives, creating a tense combination of anger and humor. The rest of the band is decomposed of David Luce on drums, Matt Skinner on bass, and the haunting tones of Jason Ravitz on accordion. Tastes like pineapple. SKYE ALEXANDER loves Celtic and American roots music. She trained as a classical singer and was once accused of murdering someone while she was practicing in the staircase before work. LUTHER MONDAY: Singer/songwriter. If you like the classic album "The Vibrators and Jackson 5 play Carnegie Hall" then you will enjoy Luther Monday. THE HAPPY CLAMS: Riding on the forefront of unpop music since 1997, this molluscular trio, led by Paul Pot and powered by the driving bass of Gail Todd and madcap drumming by Rawbird, will pound out some of their original murder and misery songs. You will hear "Mother's Dead", based on the blues standard "Mother's Children", first recorded by Blind Willie Johnson in 1927, later popularized by countless famous performers, but now demolished by the Clams. Rawbird adds his own, new "attempted murder" ballad that they will perform for the first time. THREE DRINK CIRCUS: One or two or even three ukuleles sometimes but also accordion, washboard, musical saw, and sidewalk junk. They write a mean (really mean!) murder ballad but also deliver sweet, shivery harmonies and genre-busting covers. But, of course, we won't be hearing any of that sweet stuff. MANSON FAMILY: Who knows what evil lurks in the heart of Harlan Hollander? The Manson Family do. But how many of them will still be left alive or at large before this act hits the stage? Q. Oh Magic 8 Ball, will there be three in the Manson Family? A. Concentrate and ask again. Q. Will there be two? A. Reply hazy, ask again. Q. One? A. Cannnot tell you now. The great and powerful Magic 8 Ball has spoken! INDIANA FOXBORO: When not disguised as the mild mannered sound guy for a great metropolitan music club, INDIANA FOXBORO is a champion of truth, justice and the decidedly murderous American way. He has something to tell you at the show and (believe me) it ain't good.